One of our many smiling patients. Dental implants are the solution to replace missing teeth in Orange, CT. They provide a foundation on which a replacement tooth can be placed so that it functions and feels just like a natural tooth. Implants can be used to support a single tooth, multiple teeth, or even to support a denture. The direct benefit to you is that you can have the closest thing to your natural tooth or teeth again! You can smile again, eat that chewy steak, and do all the things you used to do. They say that a picture is worth a thousand words. So go ahead and browse the photos of real patients we’ve treated to see examples of cases we’ve completed on individuals from Milford, Woodbridge, New Haven, and many other areas around our office. Before and After photo of a patient from Woodbridge, CT. Dentistry and photos by Dr. Nicholas Calcaterra. This patient was missing a lower premolar. He wanted the implant to make up for lost chewing function and to close the gap when he smiled. We helped him to accomplish both! This middle aged female patient was missing an upper canine. She came to us specifically because of our experience in helping patients like her. She told us that since losing her tooth, she never smiled because of the noticeable gap! 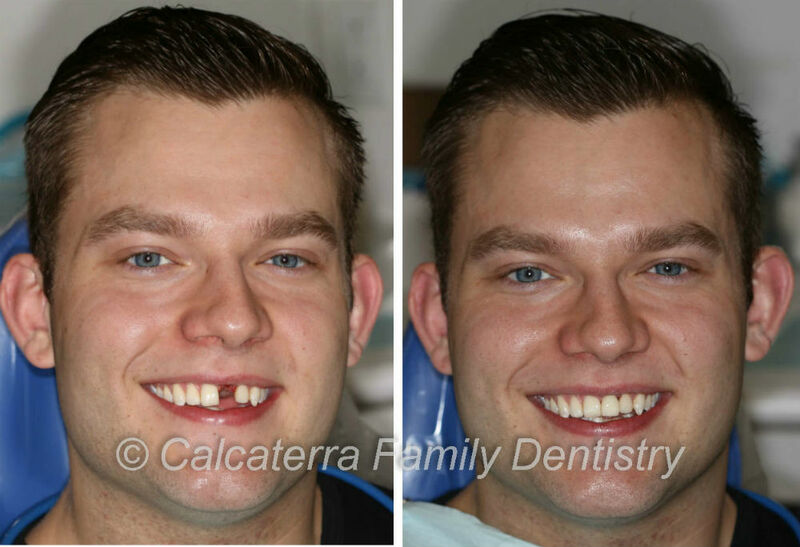 Female patient from West Haven, CT. Dr. Nicholas Calcaterra restored her smile! Dentistry and photos by Dr. Calcaterra. The closeup photos show just how noticeable the gap was. After restoring her smile, she became a new person. For real! This was a 20 year old patient from Orange, CT. He was congenitally missing his two maxillary lateral incisors. Since having braces as a teenager, he had to wear a flipper anytime he was out in public. Dental implants allowed him to go from two large gaps to two teeth! He can now smile with confidence! 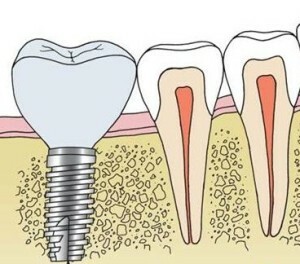 Diagram of dental Implant and crown next to two natural teeth. The diagram to the right shows the basics of implant dentistry. A durable titanium post is placed into your jawbone where a tooth used to be. Once it has stabilized and integrated with the bone, a dental crown or bridge is placed on top of it. It’s that simple! The area where the implant(s) is to be placed is evaluated and we discuss what type of tooth/teeth you want there. Sometimes there is a tooth already there needing extraction. The tooth is removed and the implant is placed. Yes, it is that simple! Our patients tell us afterwards it was much easier than expected. You wait approximately 4 to 6 months for the area to stabilize and integrate with the bone. We then make a mold of the area, take lots of photos, and you come back in 3 to 4 weeks for your new tooth/teeth. Yes, it’s that simple! Do you have a loose denture? Most patients in our New Haven area practice are only aware of implants replacing one or a couple of teeth. But did you know that they can be used to stabilize a partial or complete denture? Do you have the dreaded loose complete lower denture? 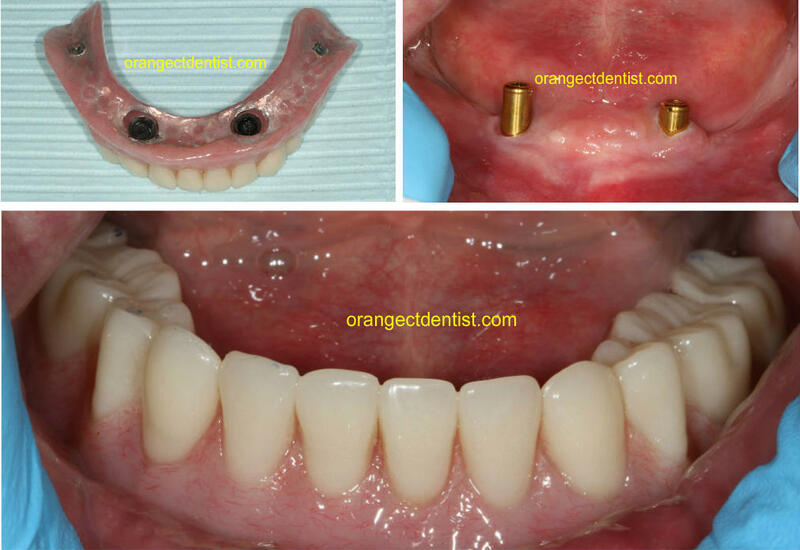 Implant supported denture done in our office. For one minute, close your eyes and think about your upper or lower denture. Think about all the times you have been out in public with friends or family and you were worried about your denture falling down or popping out. Think about all the times it actually did move or fall down. Next, think how much great it would be if your denture did not move. Think about all the activities – smiling widely, eating all types of foods, even yawning – you could do. Think about the confidence you would now have. Modern dentistry can help by stabilizing a denture. The denture is still removable but there are anchors that make it so it “snaps” into place. We’ve helped dozens of patients stabilize their dentures using implants. See our page on implant supported dentures to learn more. To learn more about our practice or to schedule an appointment for a consult, call us anytime or visit this page to request an appointment.